Last post I introduced the yarns in my new batch, Spring 2017, and promised I’d be back to share information and photos of the farms and sheep that grew the wool. It has taken a while to get round all three farms – they’re busy people – but I’m so pleased that I can now tell you more about where the wool comes from. I’ve been working with my very talented friend Emily Williams to bring you a shawl pattern designed exclusively for three yarns from Orrinside Flock. The release, of the yarns and pattern, is likely to be next Thursday 4th May. I’ll be notifying the date and time of the yarn release by newsletter (sign up on my homepage) and then also on Instagram. I’ll share a couple of sneak peeks below! 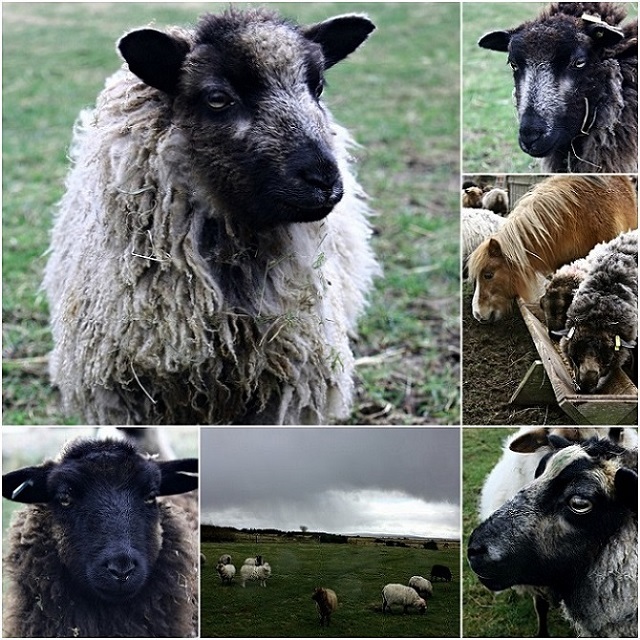 I loved working with the two women and flocks who produced the wool that went into my ‘scary fine’ Shetland yarn. Sally is the wonderful woman behind Meadows Flock. 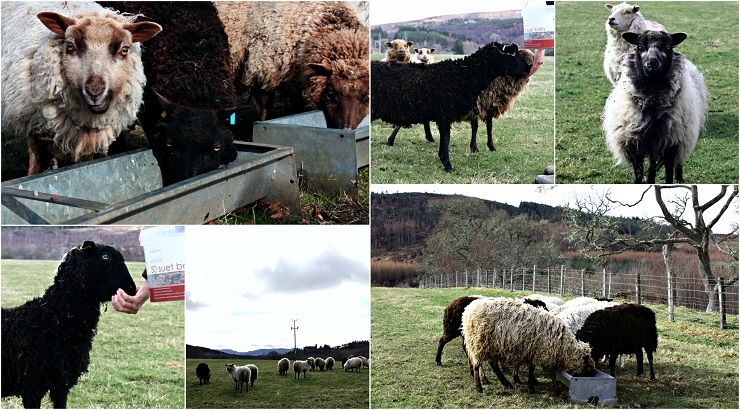 From the first moment I contacted her (as the Highland Rep of the Shetland Sheep Society) she has been entirely enthusiastic, helpful and positive about my plans for Black Isle Yarns. She has been keeping Shetlands for many years and I suspect has ‘enabled’ a great many other small flocks in the Highlands. Sally rents a variety of small fields on the edge of the beautiful old town of Dornoch and her sheep are the friendliest I’ve ever come across. On the day we’d arranged for me to visit and photograph the flock unfortunately Sally had to go to a funeral, but she left out a bucket of feed and instructed me to call ‘sheep’ as I arrived………..and lo and behold I had a very willing set of models (including Fudgie the pony!). Janet is a fairly new smallholder who Sally introduced me to. She lives inland from Dornoch in the stunning Kyle of Sutherland, on the edge of some very wild land indeed. Again Janet couldn’t have been more helpful (as well as making delicious coffee!) – I’m so enjoying meeting these lovely people with a passion for their sheep and an interest in what happens to their wool. Her flock were a little more wary of me as a stranger but were clearly very comfortable with Janet……….Janet has adopted Sally’s ‘sheep’ call and they all came running at the sound of her voice, pausing and slowing down once they spotted me. The fleeces I bought from the Meadows and Helendale sheep were nearly all coloured and I felt that the yarn options would be enhanced with some white wool. I wasn’t able to source any white Shetland fleeces directly from breeders so decided to approach my local Wool Marketing Board at Evanton. I went with an open mind, not sure whether I’d come home with any wool, but the visit was fascinating and I did pick out several beautiful, high quality white fleeces. The Evanton depot’s collection range is entirely Highland so although I don’t know the individual farm(s) I do know they’re all local to me. I also know, because of the quality of the fleeces, that the sheep must have been well managed and cared for…………sheep in poor health develop a break in their fleece and will shed parts or all of their wool. The knowledge and skill of the people who work at the Wool Board was very impressive. Rather than have them pick out fleeces for me I decided to try selecting by myself first and then get their feedback. I was pleased that 5 of the 6 fleeces I selected passed muster as being the best quality – the fifth was pretty good too but we did find a better one with a bit more searching. If anyone can point me in the direction of a breeder who has white Shetlands in the Highlands I’d be delighted – I’m still looking but have had no success so far. Ideally I’d prefer to work directly with sheep owners so they get a good return for the fleeces and so I can build a relationship with them and tell the story behind their wool. The remaining wool came from one, very eclectic, flock. 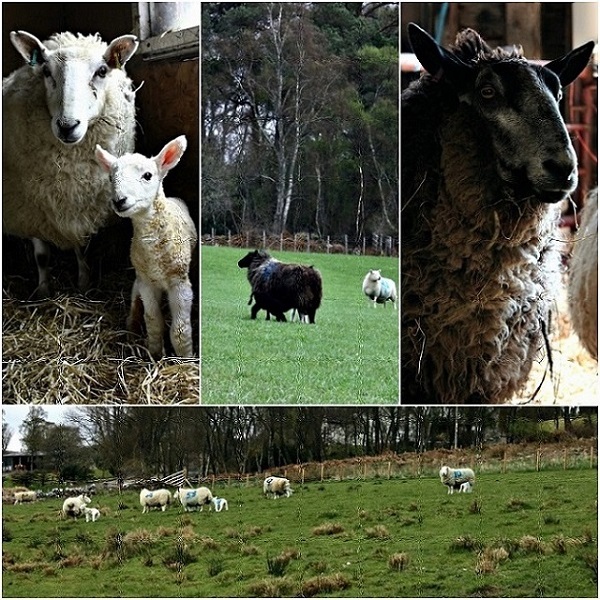 Jane is someone who is passionate about livestock and the land – not only does she work in a farm advisory role but she has a huge range of animals on her smallholding, including some very lovely sheep. 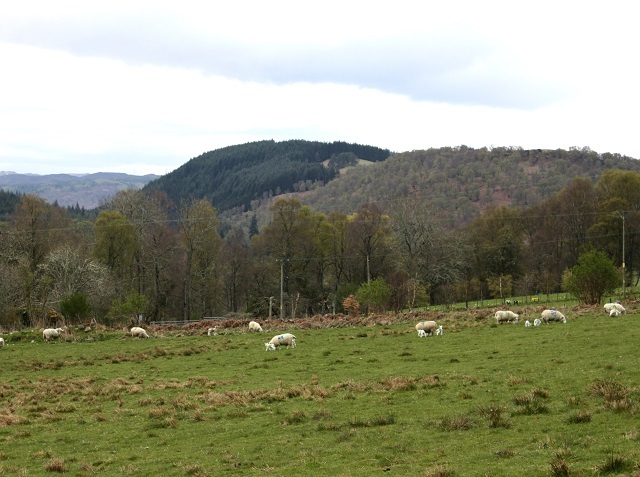 Her land is on the edge of the Black Isle, not far from Beauly, and has beautiful views inland to Glen Affric and Cannich – a very lovely area with hill after hill on the horizon. Her core flock consists of North Country Cheviots which are the main sheep around here. They’re not generally thought to have particularly exciting wool and it is often written off as being fit for carpets only. This is most definitely not the case with the fleeces I chose from Jane’s flock! Alongside her Cheviots Jane has some really special mixed breed ewes. You can tell from their names how much she loves and enjoys them! The three ewes whose beautiful wool I picked out are Horse (Bluefaced Leicester-Cotswold cross), Monkey Face (possibly Gotland-Hebridean cross) and Frankenstein (Bluefaced Leicester-Cotswold-Cheviot cross) – shown left to right respectively (although Horse, as an old lady who wasn’t at all willing to cooperate, has a stand-in by way of her daughter aptly named ‘Horse’s Daughter’!). The three yarns from these lovely ladies are the ones that will be released next week – see below for some first glimpses of Emily’s fabulous shawl design. Since I first met Jane last autumn she has bought a couple of Cotswold ewes and a Wensleydale tup – and sent me an excited text to tell me about them! I’m very much looking forward to some more lovely cross breed fleeces in the years to come. I hope you enjoyed that wee glimpse of where the yarn comes from. Here’s a couple of Emily’s photos of the Eathie Shawl in progress. Yarns from, left to right in both photos, Monkey Face, Frankenstein and Horse. Spring 2017 – Batch Number 2!